? - 114 Sister of Trajan and mother of Matidia. 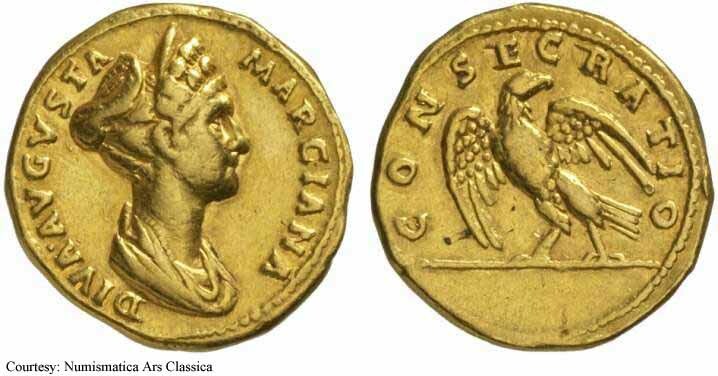 RIC 743 (Trajan), BMC 648 (Trajan), C 3 Aureus Obv: Obv: DIVAAVGVSTAMARCIANA - Diademed , draped bust right. Rev: CONSECRATIO - Eagle standing left. 114-117 (Rome). $6,790 12/5/02. 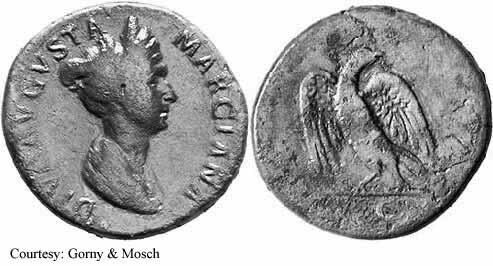 RIC 742 (Trajan), BMC 531 (Trajan), C 2 Denarius Obv: MARCIANAAVGSORORIMPTRAIANI - Diademed, draped bust right. Rev: CAESAVGGERMADACCOSVIPP Exe: MATIDIAAVG - Matidia seated left, holding patera and resting hand on child's head; child to left. 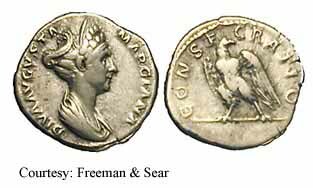 RIC 743 (Trajan), C 4 Denarius Obv: DIVAAVGVSTAMARCIANA - Diademed, draped bust right. Rev: CONSECRATIO - Eagle standing left. 114-117 (Rome). RIC 745 (Trajan), C 8 Denarius Obv: DIVAAVGVSTAMARCIANA - Diademed, draped bust right. Rev: CONSECRATIO - Eagle standing right. 114-117 (Rome). $800 5/22/02. 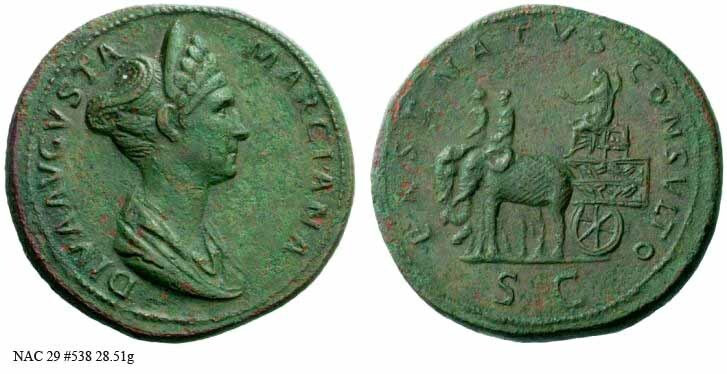 RIC 748 (Trajan), C 6 Sestertius Obv: DIVAAVGVSTAMARCIANA - Diademed, draped bust right. Rev: CONSECRATIO Exe: SC - Eagle standing left. 114-117 (Rome). 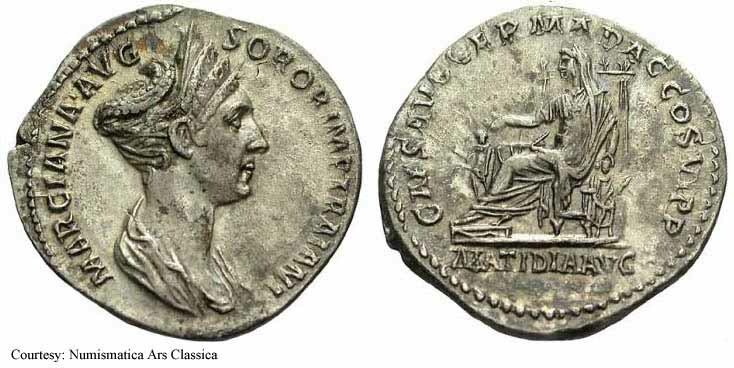 RIC 750 corrected (Trajan), BMC 1086 (Trajan), C 13 Sestertius Obv: DIVAAVGVSTAMARCIANA - Diademed, draped bust right. Rev: EXSENATVSCONSVLTO Exe: SC - Marciana riding elephant biga left, holding patera and scepter. 112 (Rome).